Kit Hill has always been an important site and has been shaped by over 5,000 years of human activity. From its use by early people for agriculture and religious purposes to the more recent exploitation of its stones and minerals. The Hill is also home to a wide range of flora and fauna, much of which depends of its heathland habitats. 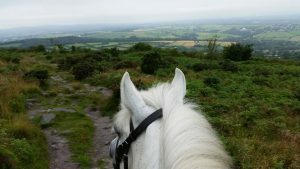 Located between Dartmoor and Bodmin Moor, this wild, rugged granite hilltop is famous for its fine views and fascinating history as well as its flora and fauna. With 400 acres (152 hectares), Kit Hill is the most dominant landscape feature in East Cornwall. Train – Gunnislake train station is approximately 3 miles to the east. The Tamar Valley Line runs from Gunnislake to Plymouth. Trains run daily all year. Bus – First Western National Number 79 runs between Tavistock and Callington, passing Gunnislake Station. On Sundays, the 190 bus stops at Kit Hill . Car – Main vehicular access is from the east, off the link road between Monkscross on the B3257 and the top of Silver Valley on the A390. You can also park at the foot of the incline on the north side, just off the B3257. Please have a look at the online mapping system for the location of Kit Hill. In case of an emergency, the nearest public telephone is located at Monks Cross. The grid reference of the Summit Car Park is SX 37476 71380. Walking Trail – there is an easy to follow way-marked trail . Allow 2 hours to complete.The path is uneven and can be wet in places. Please close all the gates. Horse Trail – there is a circular horse trail, way–marked by wooden posts with blue arrows. Please do not ride on the footpaths or the summit. The Hill supports a variety of insects, reptiles, birds and mammals. Cuckoo, Stonechats, skylarks and tree pipits nest in the heathland, while birds of prey such as buzzard and kestrel hunt overhead. Furry moth caterpillars are common on the heather and during the summer months the sunny slopes are popular with basking adders. Nature has even reclaimed mine workings with bats roosting deep underground.